Artist Profile - Tomas Janzon - Welcome to the World of Greg Bennett Design Acoustic Guitars! : Welcome to the World of Greg Bennett Design Acoustic Guitars! Tomas Janzon was born in Stockholm, Sweden. His musical quest started at the age of seven playing the recorder. At age eight, he began studying the cello and by 12 he was performing with the chamber orchestra Collegium Musicum. After studying at Musikhogskolan, The Royal School of Music in Stockholm, Tomas embarked on his professional career, arriving in Los Angles in 1991 to perform and study with guitar guru Joe Diorio. He was awarded The Outstanding Player of the Year at GIT in 1992. 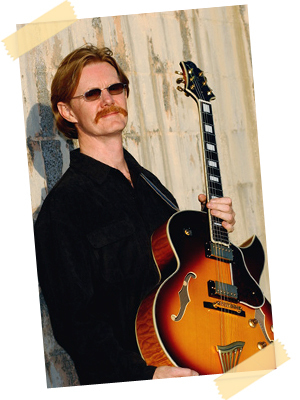 In 2000, he completed a MM with honors in Classical Guitar at USC Thornton School of Music, studying with Scott Tennant and James Smith, also studying composition for Vince Mendoza and teaching at the Jazz Studies and Studio Guitar Departments. He spent 2001 as an Artist-in-Resident at Selkirk College, teaching and performing music. Tomas continues to travel around the world performing, teaching, composing, and recording music. My motto: One planet one people, please.